Before I started blogging, when I got interested in a series, I would barrel through the whole thing in one giddy stretch. Three books, twelve books, twenty books, whatever. But blogging has made me reluctant to do that, partly because it would be boring for you to read, but also because it would be boring for me to write. However, one advantage of that kind of series reading is that I could get totally immersed in a world. I’d feel wrapped up in it; I’d eat and breathe it. And if it was a complex world, something like Dorothy Dunnett’s Europe or Stephen King’s Mid-World, I wouldn’t have to re-orient myself to that place when I started a new book. I was already there. 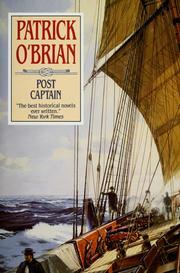 It was that desire to avoid the re-orientation process that led me to read Patrick O’Brian’s second and third Aubrey-Maturin books right in a row. 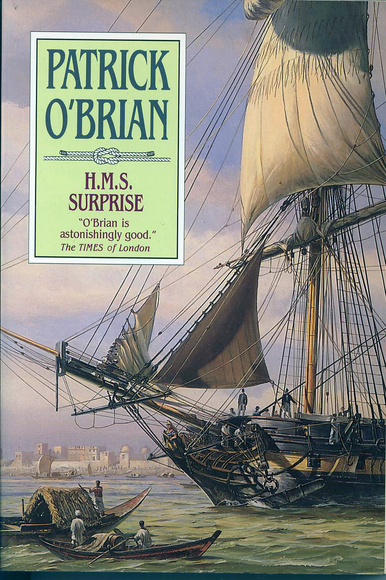 If you know the series, you’ll know that O’Brian plants you right into the world of the Royal Navy during the Napoleonic Wars. Landlubber or not, you’ll just have to work out for yourself what the mizzenmast is and whether it’s even important. (It’s important to the ship, of course, but not necessarily to the reader.) Once I got my sea legs in Post Captain, I didn’t want to lose them, so I pressed right on and read HMS Surprise. Jenny had told me a while back that she was convinced—convinced!—that I’d love this series by the time I finished HMS Surprise. So what did I think? Let’s take a look. Post Captain begins with a declaration of (temporary) peace between England and France. With no ship to command, Captain Jack Aubrey rents a house with Doctor Stephen Maturin, and the two get to know the ladies of the neighborhood. The result is something like a Jane Austen novel from the male perspective. The sea might have been dangerous, but land brings a whole new set of dangers, one of which nearly wrecks Jack and Stephen’s friendship, and both men are at risk of having their hearts broken. It’s something of a relief for Jack to get back to sea, but he’s given such an odd ship that it’s hard to see how he could earn enough prize money to become a suitable husband, which he now very much wants to be. When HMS Surprise begins, Stephen has been taken captive by the French while doing intelligence work. Jack and the crew of his new, temporary command, the Lively, rescue him from his torturers. Because of Stephen’s failing health and desire for a warm climate, Jack is all too happy to get be sent to India on the HMS Surprise. On the journey, Stephen indulges his love of naturalism by collecting plants and animals everywhere they go. Bugs, plants, even a sloth and a tortoise join the ship. The trip does wonders for his health, but a much-anticipated meeting in India puts his heart in danger once again. Both of these books are filled with big events, one right after the other. They’re sometimes highly comic, as when Jack must dress up as a bear (!) to escape France. Or when Jack wails at Stephen for bringing a vampire on board in Brazil. The vampire, as it turns out, is a sloth that is highly suspicious of Jack until he befriends it with some cake sopped in alcohol. But the humor is mostly leavening that keeps the books from being unbearably tense. There’s physical danger from storms and scurvy, never mind the French. On top of that, there are creditors trying to arrest Jack whenever he’s on land in England. And if Jack and Stephen can remain alive and free, they still have to sort out their relationships with the women in their lives! The relationships are what make these books work. There is, of course, the central relationship between Jack and Stephen, which is badly tested in Post Captain but I don’t think it’s a spoiler to say it comes out all the stronger for it. (There are, after all, 20 books about these two. Naturally, the friendship will survive.) The two are an odd pair—near opposites in temperament—but they seem to admire and respect each other because of their differences. It’s sweet to see them worry about each other. Another relationship that I was really taken with was that between Stephen Maturin and Sophie Williams, the woman Jack becomes interested in. Both Jack and Sophie end up confiding in Stephen, and it was fascinating to watch Stephen’s friendship with Sophie develop. He loves her because he loves Jack and wants to see them both happy. And he never treats her as anything other than an intelligent person with her own mind and will. This sort of “friend-in-law” relationship is not one I remember seeing much in fiction, and I really enjoyed watching their concern and affection for each other grow, separate from their love for Jack. My feelings about Diana Villiers are far more mixed. Diana is a cousin to Sophie, and she has just returned to England from India, where her husband and father were recently killed. She’s in a difficult position, having to rely on her rather conventional relatives, and her willingness to speak her mind and do what she wants makes her an appealing character to a modern reader. However, some codes of respectability are there because they keep others from being hurt. Diana’s sexual openness (how open she is is left ambiguous) causes problems for the men in her life on numerous occasions, and the way she toys with Stephen and Jack frosts me. Still, what choices did she have but to always be looking for an angle? And is it her fault that men makes assumptions about her intentions and desires? On the one hand, I love that she flouts convention. On the other hand, I’m wondering what makes her so different from a Mr. Wickham? Men may have the power in her day and age, but they’re still people who can be hurt. I may not know how I feel about Diana as a person, but she’s a fascinating character, which is the important thing. So the verdict? Jenny was, of course, absolutely right. I’m glad that I continued past the first book, which I enjoyed but wasn’t sure I enjoyed enough for a 20-book series. I must warn you that the writing does require some concentration. I had to take a break from these over the weekend and read a children’s book just because my brain was feeling strained. (A sinus headache over the weekend was no help.) I made a conscious choice early on not to worry much about the nautical terms, which worked out fine. Even if I couldn’t follow all the ships’ movements during the battles, the outcomes and the sense of peril were sufficiently clear. There are some amazing scenes—including one surgery that has me wincing in pain even now. I found that if I focused on the relationships between the characters, there was plenty to keep me interested and eager to keep reading. O’Brian is a subtle writer who doesn’t explain everything. You have to read between the lines to catch the undercurrents of emotion and the subtext in some of the conversations. It’s the kind of writing that almost demands multiple readings. But the effort certainly pays off. What a great analysis of the “friend-in-law” relationship – I can’t think of another example either. HMS Surprise may be my favorite in the series, despite all the pain Stephen endures (including poor Dil). I didn’t care for Post Captain the first couple of times that I read it, but I’ve come to appreciate it more. Have you read Naomi Novik’s Temeraire series – Patrick O’Brian with dragons? I have really enjoyed those, despite some initial reluctance to read them. I liked Post Captain, but I think I liked HMS Surprise just a little more. It felt tighter and more unified. And Dil broke my heart! I haven’t read the Temeraire series, but I’ll have to look into it. So glad you are enjoying these – they are some of my favorites. I always meant to read more of these (I think I got up to #5), thanks for reminding me! I describe them as Jane Austen gone to sea myself, which is probably not very accurate, but I do think gives a succinct description for the type of person that would like these, especially Post Captain. I kept thinking that Aubrey’s adventures might not be so different from what Captain Wentworth experienced, which was fun to imagine. I was thinking about saying, “That is all,” because that was my basic reaction, but I thought I’d at least try to be a little more articulate. I’m so, so, so delighted you liked these so much. The slow build of trust and friendship and eventually love is marvelous in these. I am so there with you about Diana — she is such a complex character, which for a necessarily male-focused series is fascinating and unexpected. And the humor (“You have debauched my sloth,”) and the music, and the growth of the characters, and the lovely writing — I feel like Master and Commander is a slow start, but the rest of the books make it all worth while. So glad you have embarked on them. Diana really is an amazing character. I have no idea how I feel about her–my emotions were all over the map–but the complexity and ambiguity are stunning. I’m with Jenny – hooray for your conversion to the joys of Aubrey-Maturin. 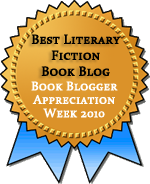 And this is a wonderful, wonderful post about the two books. I’ve never thought before how interesting the relationship between Stephen and Sophie is. You make me want to re-read Post-Captain to refamiliarise myself. :-) Of course, because you read much quicker than me, you’re now nearly caught up on my progress through them. I’ve only read the next one, The Mauritius Command. Book 5 is a top priority. I don’t know how quickly I’ll get through these because I’m uncertain the one-a-month plan which worked so well with the Morland books would work with these. (The Morlands are really fast reads, and these are more subtle.) I’m thinking of reading one or two every three or four months. Two in a row worked beautifully for getting immersed, which helps me with this kind of book. I’ve read Post Captain last year (loved it) and the next three are patiently waiting in the TBR. It’s a good idea to read them one after the other. Next thing you know, you’ll be cooking the dishes and making the drinks from the series, which it being puddings, grog, flip, not to mention Côôôôq au Vin or A Whole Leaf of Pondoo.